The fair-trade clothing, food, jewelry, accessories and children’s items at Greenheart Shop, 1911 W. Division, have roots on the Mediterranean island of Ibiza, Spain. There the nonprofit Greenheart organization has been involved in ecology, student-exchange, and music projects affiliated with Spain’s Fundación por el Futuro. 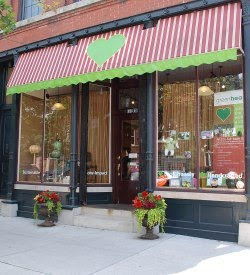 Chicago’s Greenheart Store grew from ecotourism and fair-trade partnerships with the Spanish group. The Greenheart store sells fair-trade goods, for which wholesalers monitor work conditions and give producers technical assistance. Its representatives will tell more about the organization and its history at Monday’s meeting of the East Village Association. The presentation starts at 7 p.m. in the Happy Village tavern, 1959 N. Wolcott. Greenheart relocated this summer to the former Porte Rouge space from a smaller storefront at 746 N. LaSalle, now the group’s travel agency. At last month’s Renegade Craft Fair, the shop sold houseplants grown at the Pacific Garden Mission. Earlier in September, the store hosted a wine tasting and beading demonstration with South African visitors.